Universal Metal Engineering is India's leading manufacturer and supplier of all types of Portable Cabins which can be used as Site offices, Security Guard cabins, Portable Toilets & Bathrooms, Bunk house, Portable Buildings and Modular Buildings. Our Portable Cabins are best in quality with excellent aesthetics and with a life span of more than 25 years. universal metal engineering Porta cabins are High at Quality but Low at Cost. Interior Construction of cabins: MS Square Pipes, High Density Insulation, Laminated Plywood, Marine Plywood as base with Vinyl Carpet, Sliding Windows and Electrical fixtures such as Tube Lights, Fans, etc. Usage: The Site offices are used by Builders/Developers/Contractors/Engineers at their respective construction sites. The Site Offices are also used by other industries for in plant Office/Accommodation. As the cabins are transportable and can be easily located from one site to another they are also used by Road developers at road construction sites or flyover construction sites and at Metro/Mono rail sites. 40ft x 10ft x 8.6ft or any other size as per your requirement. 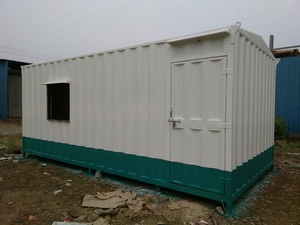 Built with same materials as the Site Offices, the Security Cabins are used at constructions sites, Buildings, Malls , parking area , entrance gate etc. These cabins are also used as Toll Booth at collection centers. 12ft x 10ft x 8.6ft or any other size as per your requirement. universal metal engineering Portable Toilets come with inbuilt plumbing accessories. The toilets can be customized to include EWCs, Urinals, wash basins etc. • Luxurious cottages & Rooms. From enquiry to delivery, you will receive top quality service, and we guarantee that no matter how complex your specification we will deliver you the same build priority as a more conventional project. We hope that you will find this site informative, and we would welcome the opportunity to discuss any enquiry you may have.